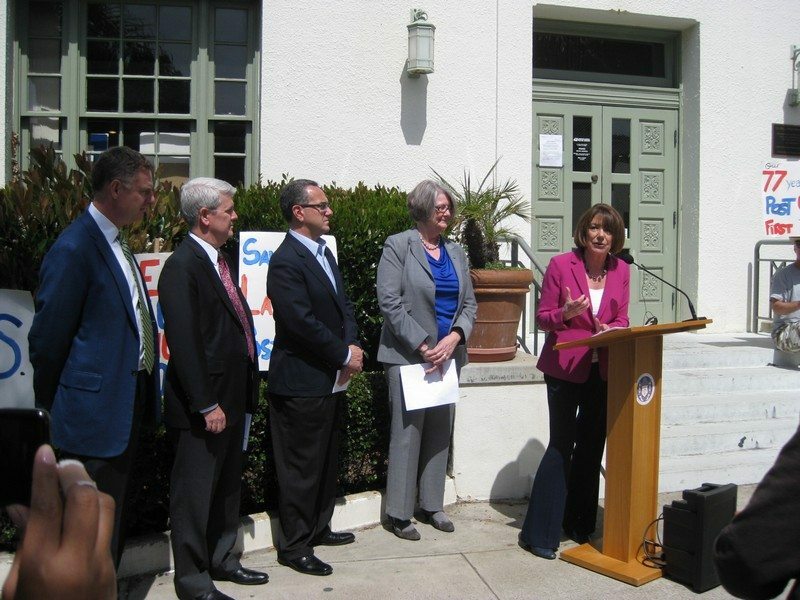 Davis, whose 53rd District previously included La Jolla prior to redistricting, had introduced legislation in the last Congress that would allow community interests to purchase the building and lease it back to the Postal Service at a nominal rate. Peters, as the new representative to the area, has taken up that mantle and reintroduced the bill. “The U.S. Postal Service is under attack,” and they need more funding, said Davis. Despite efforts over the last several years to save the facility, the post office received notice last Friday that the Postal Service intends to relocate the branch and sell the property. “I will personally appeal the decision and do everything in my power to support the community’s effort to preserve our post office,” said Peters. The legislation first presented by Davis and reintroduced by Peters allows for community groups to be granted the right of first refusal to purchase the property at fair market value before it can be sold to outside private interests. The La Jolla Historical Society has taken a key role in the charge to save the post office, along with members of the community who formed the Save Our La Jolla Post Office task force. They have until April 6 to file their appeal of the proposed sale. At the current time, the Postal Service has not identified any potential buyers for the property. The relocation of the post office can prove to be problematic for the Postal Service, however. A new location must be found within one mile of the current building, and new requirements for parking and access must be met that do not apply to the current site at 1140 Wall St. in Downtown La Jolla. Given the property values in such an upscale locale, it would seem unlikely that the Postal Service would be able to find a suitable location. The Postal Service cannot sell the current property until they have identified a new location. If the Postal Service were to relocate more than a mile away, it would then be considered a closure, and there is a nationwide moratorium on post office closures, said Joe LaCava, the chair of the Save Our La Jolla Post Office task force. “We think that they have come to the conclusion that there is no place to relocate,” said LaCava. The reasoning behind the Postal Service’s desire to sell the property remains unclear, as it is not known whether the La Jolla branch is a financial drain. The Postal Service refuses to share that information, claiming that it is a privately operated entity and thus not required to share detailed financial information, said LaCava, relaying conversations he has had with the Service. Lantry noted that the group has received a proposal from the Postal Service on a leaseback agreement for a smaller portion of the existing building. The purchasing entity—such as the La Jolla Historical Society—could then use the rest of the structure for other purposes, like a museum or storage or other profit generating uses. “This whole process has been a bullheaded bureaucratic bungling of the highest order,” said Lightner, whose City Council District is centered in La Jolla. Before we get overly steamed up about this attempt to dump an historic building on the market let’s remember that the Postal Service is under attack by FedEx and UPS whose lobbyists and compliant Congresspersons would benefit from the sales of valuable old substations like La Jolla’s. If Susan Davis and others in Congress want to save the USPS they ought not allow the sale of government buildings to private development, period, no matter whether in La Jolla, where people have the money to buy those buildings, or in Encanto and other neighborhoods that need those accessible services and can’t afford to buy the buildings. And they would oppose Saturday closings, and they would undo the legislation requiring the USPS to fund its pension ten years ahead, which everyone agrees is what is bankrupting the service. This little tea party in La Jolla is a disgusting display of exceptionalism in which the wealthy are treated differently because they are, after all, wealthy.